Do you remember the first time you received a “personalized” offer in the mail? For me it was in the early ‘80’s and the thrill was brief. It didn’t take long to realize it was simply a computer-generated mass mailing designed to appear personalized. Today that desire for a truly individualized communication continues to be a top priority for the vast majority of consumers, and a critical topic for marketers. Before we explore the concept, we need a shared view of its meaning. From our perspective, personalization isn’t just addressing your customers by name. And it isn’t referencing a single element from their profile. When we advocate for personalization, we’re talking about genuine, individualized treatment. And here’s the clincher—your customers expect this kind of hyper-personalization. They want to have their needs and preferences understood. They want to be valued for the money they spend with your brand. The first chart tells us that tailored offers get more attention when your customers are in the shopping phase. Personalization means those people are more likely to notice your brand and seriously consider you for their next trip. The second chart shows that your travelers expect to be treated as individuals at every stage—shopping, booking, during their trip and even afterwards. . Your ability to understand their needs is just as important to them as your brand reputation and staff attitudes, and even more important than loyalty points. You can see that the implications are profound. Finally, the third chart drives home the fact that your travelers want to know that their patronage is appreciated. They expect that if they spend a larger portion of their wallet with you, you’ll reward them with extraordinary service or special perks. 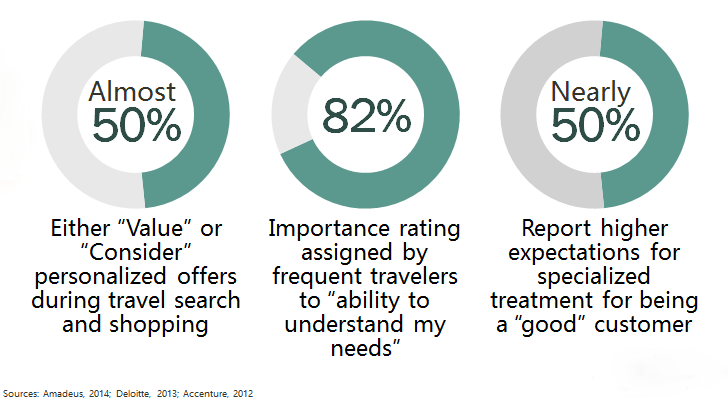 What’s clear from these stats is that people want individualized treatment, and we know from our work with a variety of travel suppliers how effectively such treatment drives brand affinity. When done correctly, personalization not only helps get your brand noticed, but also drives revenue and long-term engagement. Epsilon undertook an extensive investigation of the connection between brand affinity and wallet-share within the travel sector. Simply put, personalization leads to increased spend. How successful is your brand at personalization? According to recent research, if you’re like most brands, you have a lot of room for improvement. The majority of consumers are not impressed by today’s attempts at personalization—they cite superficial personalization as the primary culprit. To truly engage your customers through individual treatment, you need to devote greater attention to the period between booking and the day of travel to anticipate and capitalize on your guests’ needs. And focus on delivering potential value-adds while they are traveling. Post-trip you can help them share their experiences. You have many opportunities within these windows to wow your guests, show that you understand their value and win their loyalty. You can demonstrate that you know more than your consumer’s <First Name> and earn their trust and attention. The first step is having a rich 360 view into your customers that includes wallet-share information. From this data you can extract insights to craft meaningfully personalized messaging and offers that truly resonate with your customers. To learn more about how to identify your customers’ needs and preferences and what to do with those insights, watch the full webinar here.